One of the main principles behind the physics of cheerleading is setting up good weight distribution in the stunts, such as pyramids. The pyramids are created by putting a greater number of people at the bottom than at the top. The stronger (and usually heavier) team members form the support base at the bottom while the lighter team members are at the top. This enables greater ease in performing stunts that involve holding the chearleaders up (at the top of the pyramid), and tossing them into the air. Stunts, like the ones shown in the three pictures below, rely heavily on having the right number of people at the top and bottom of the pyramid. As you can see, keeping balance is critical during the stunts, as well as keeping an even weight distribution among the team members involved in supporting the weight of the other team members. Even weight distribution is important because it helps the supporters keep the cheerleaders at the top of the pyramid level. If the weight distribution is uneven, one side of the cheerleaders at the top of the pyramid will dip more than the other side, and it won't look as good. The picture above is a great example of how the weight is distributed evenly among the team members. If you look closely at the picture, you'll see that the two cheerleaders in the middle of the pyramid are each supporting half the cheerleader's weight at the top. And at the bottom of the pyramid there are six team members, all supporting the three girls in the middle and top of the pyramid. Therefore, each team member at the bottom is holding approximately half a cheerleader's weight. Therefore, the weight is distributed evenly among all the team members who are involved in supporting the weight. It's clear that good weight distribution (and how to achieve it), is one of the main areas of focus in the physics of cheerleading. Some of the more advanced stunts involve tossing the cheerleaders into the air, and them doing flips and twists while airborne. This can incorporate some gymnastics skills as well, which adds a dynamic component to cheerleading physics. 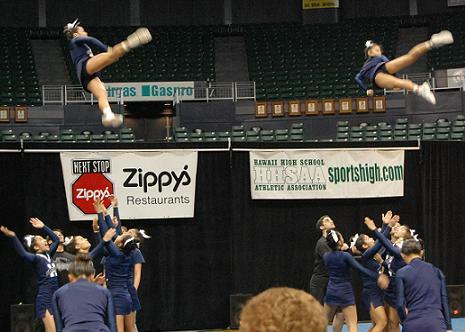 The figure below shows a stunt in which the cheerleaders are thrown up and into a twist. The landing of the cheerleaders is cushioned by the support base, which catches the cheerleaders in a cradle position. They do this by bending their knees during the "catch", which allows them to more easily absorb the force of landing. This in turn reduces the forces acting on the cheerleaders during landing. This concludes the discussion on cheerleading physics.